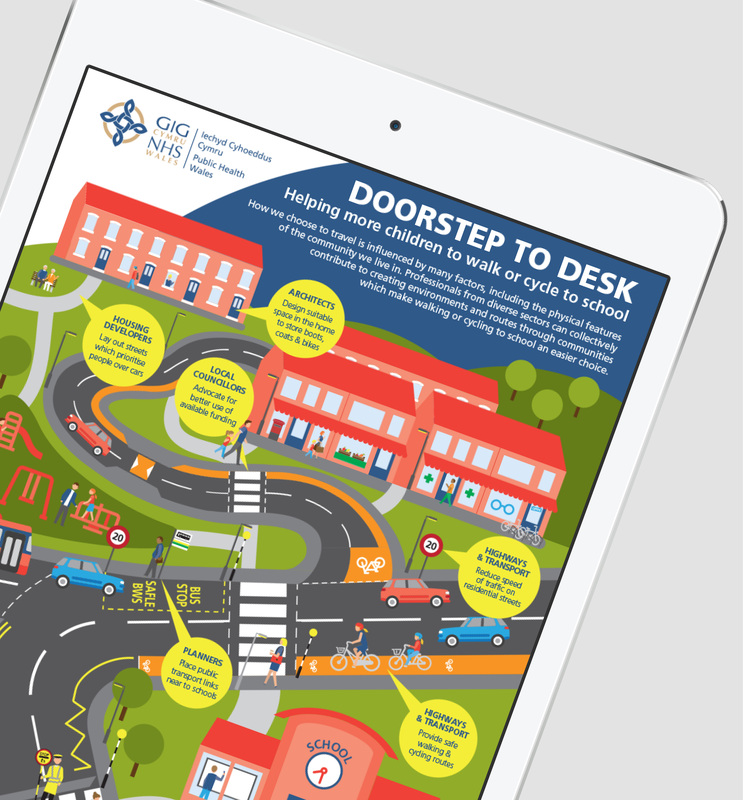 Recently, we worked closely with Public Health Wales to design ‘Doorstep to Desk’, a campaign aimed at engaging organisations to help play a bigger role in encouraging children to make walking, scooting, or cycling their preferred way of getting to school. The campaign was produced in collaboration with experts from the Active Travel to School National Stakeholder Group who focus on working together to make small improvements locally, for a big impact Wales wide. The brief was to illustrate the journey from home to school highlighting where housing developers, transport officers, councillors, schools, and even police could play a vital role in making routes from doorstep to desk easier and safer and in turn hopefully encourage parents and children to be more active and to stay healthy. It was important that the infographic was as true to life as possible. The design pays great attention to detail and includes all correct road markings and road safety signs to support the key messages accurately. After creating a range of social content from the infographics statistics, these were then shared and discussed on social media using the hashtag #DoorstepToDesk. Following on from the success of the infographic, Creative Loop were then commissioned to create an animation based around the infographic, bringing it to life and driving the campaign to a wider audience, creating bigger impact.